More than 200 scholarship recipients, donors, faculty, staff and community partners of the University of Cincinnati Clermont College gathered Oct. 9 on the college’s Batavia campus for the 2018 Community Appreciation Luncheon. The event underlined the importance of donor-funded scholarships to the education and lives of students. 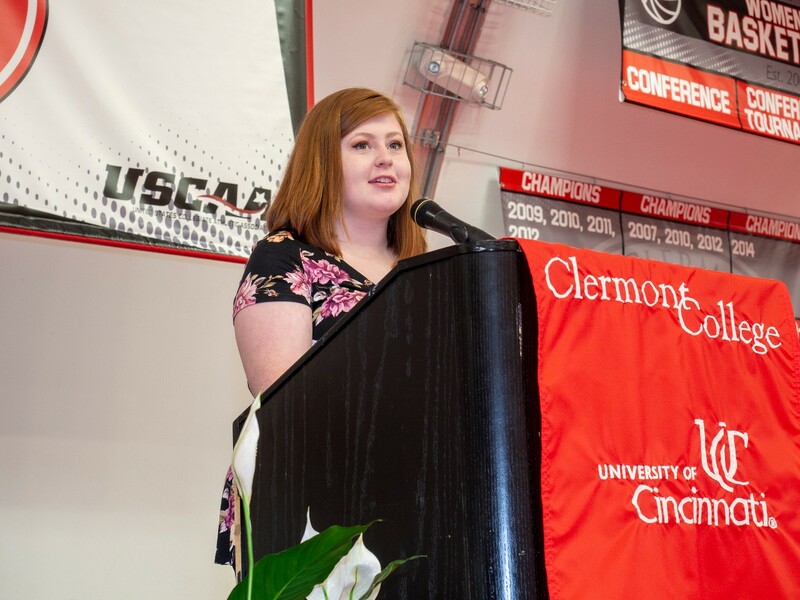 UC Clermont Dean Jeff Bauer welcomed the attendees in the college’s Student Activities Center, noting that the college awarded $140,000 in private donor-funded scholarships and $267,000 in Merit Scholarships for academic year 2018-19. A number of newly established scholarship funds were recognized as well. One of the scholarship recipients in attendance was Elizabeth Adams, who received the Business, Law and Technology Faculty Scholarship and will graduate with her associate degree in Paralegal Studies in Spring 2019. Adams has already found a full-time job as a paralegal for the bankruptcy and personal injury law firm Kathleen Mezher and Associates. Katie Foran-Mulcahy, director of the UC Clermont Library, also shared how private donors made possible the transformation of the college’s library into an inviting, modern space for students to study and collaborate. In 2014, Frederick Marcotte, UC Clermont’s original librarian, died. Marcotte’s estate included a planned gift to support his passion — providing cutting-edge library services and facilities for UC Clermont students. Marcotte’s gift became an endowed fund, and it was that endowment that jump-started the library project. Since then, other community donors have continued to support the transformation.